Ok, let’s talk amplification, people. I’m talking about the means by which guitars – and in my case, almost exclusively acoustic ones – are made louder than they naturally are. Three reasons why I decided to do this. 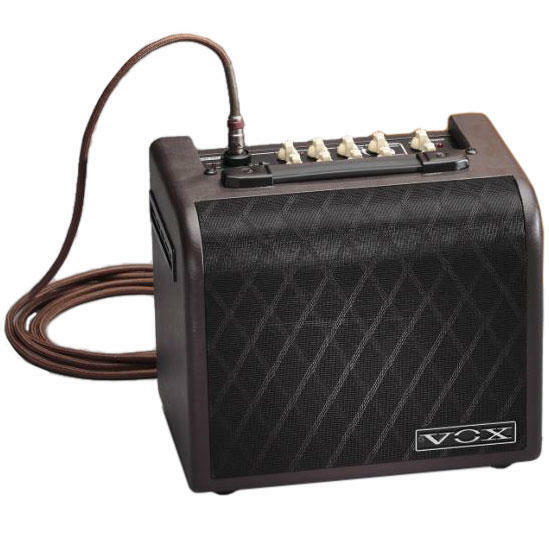 First, Vox have just brought out a new range of acoustic amps and, being Scottish, I thought it was a good time for you to look again at the previous lot as they’re likely to be on sale in a guitar shop near you soon. Secondly, since the original post I did about my first acoustic amp, the Vox AGA 30, I have splashed some cash on the Marshall AS50D and I thought, after a good year or so of use, it was time to compare and contrast the two. The third reason is pretty shameless, really. Week in, week out, month in, month out, year in, year out, that Vox amp review gets hits. It just keeps on trucking as the most visited post I’ve ever done. Honestly. I might have written the most brilliant literary works of fiction, the most penetrating gig reviews, the most acerbic Dorothy Parkeresque jeu d’esprits, and none of them would have done as well as that amp review, according to the WordPress stats. Any of you who’ve read the original review of the Vox will know it was pretty positive. So why buy a second amp? To explain, I have to tell you a little about my musical life, so any of you that know this already, you can scan on. I play with two bands: my own acoustic duo, Tribute to Venus Carmichael, and my mate Mark Allan’s country punk outfit, Isaac Brutal. As far as Venus was concerned, my motivation was to make us self-sufficient for small pub back rooms, having the additional option of more inputs should there be a bit of backing vocal needed, or even just another place to jack in another guitar. And as for Isaac Brutal, well. The current line up consists of drums, bass, two electric guitars, singer and me. Frankly, the little Vox wasn’t quite up to being heard above the racket. So I had me a little tour of Amazon’s warehouse deals section, and found myself a good bargain of a Marshall AS50D in a very natty racing green. And on the first – and arguably least important – point of comparison, looks, the Marshall wins hands down. Just look at it! It’s like a vintage Aston Martin that’s been compressed into a rectangular box. Utterly gorgeous. And, while it shouldn’t matter, when you’re setting up for a gig and people see that legendary Marshall signature across the grill, it does look – well, a bit like you know what you’re doing. The Vox? They’ve tried their best with a tan leather effect for the box, a vaguely tweedy cover for the speaker, and vintage-stylee ivory-coloured knobs, but it pales in comparison, frankly. So, half a point maybe for the Marshall. On the other hand, I would give a full point to the Vox for relative weights – it’s light as a feather, whilst the Marshall, er, isn’t. Frankly it’s a big clunky bugger to lug around. Yes, yes, you say. That’s all very well, but how do they operate in gig conditions, and how do they sound? The first thing I’m going to say may sound unimportant, but if you frequent the kind of murky venues I do, and/or have less than perfect vision like mine, it’s kind of worth half a point to the Vox. Its knobs are on top, and a bit easier to twiddle as you go along as a consequence. Even if you have the Marshall on a chair, you’re going to have to squat down and peer at the controls in a way that’s frankly not terribly rock and roll. On the other hand, as I found at an outdoor festival a couple of years ago, the fact the Marshall’s electrical inputs are tucked away under an overhang on the front elevation can be an advantage if it starts to rain. At that time, I only had the Vox, and it was buzzing in a way that didn’t give me a lot of confidence as to my future well being. I mean, literally dying on stage may be rock and roll, but I’m hoping to keep it to the metaphorical kind for a few years yet. Controls-wise, they’re initially similar: both have two inputs, each with bass and treble controls, anti-feedback, and chorus and reverb options. The Marshall has a separate, more sophisticated two-knob chorus effect, whilst the Vox has a single knob that gives you reverb, chorus, or reverb and chorus. Since it’s mainly reverb I’m looking for, the difference doesn’t put me up or down, really. The Marshall also has greater sophistication regarding loop options and a DI socket, but, again, I’ve not investigated any of these options yet – either I’m using the amp as the sound source, or I’m DI’ing direct into the PA with the sound guy mixing for me. The Vox has a line out facility which was used to great effect at one early gig (see previous review). Both have a footswitch socket – which, interestingly, the new acoustic guitar Vox, the VX50AG, doesn’t seem to have, according to a recent review in Acoustic. Sound-wise, there are differences. My main acoustic guitars are, firstly, a Lag ACE100 that I’d recently got at the time of the first review. Outstanding sound acoustically: unfortunately, the pickups are a bit rubbish. I need to get one of those LR Baggs ones some time for it! And secondly, my latest baby, which you can see me wielding in the picture above: an Epiphone EJ200CE, an absolute beast of a thing based on the original Gibson Jumbo model. I may do a comparison review between the two guitars at some stage, as they’re similar in price point, but perform a very different purpose for me: the Epiphone is actually quite quiet to play acoustically, but amped up, it sounds plenty sweet – and loud. (If you want a decent review of the latter in the meantime by a gigging musician, check out this one). Here’s the thing. Up until Wednesday night’s gig, I would’ve said, (and indeed was saying in an earlier draft of this) if I’m playing a small, intimate gig, as I almost always am (the stadium tour will have to wait another year or two, or maybe another lifetime) the Vox is the thing I want to plug into – especially the input which doubles as a vocal channel. It gives the Lag a lovely, honeyed sound, and the Epiphone, too – although she’s never quite going to match her older sister for tone. If the Lag were a Rioja, she’d be a Gran Reserva for all those gorgeous woody notes. On the other hand, I’d said, if I’m gigging with the Brutal boys (and girl) and I need to be heard higher up in the mix (on those rare occasions where I’m playing the riff, for example) then the Marshall’s the thing I lug into the venue. Much more resistant to feedback, its 50 watts can be used to good effect for the Epiphone or – and here’s why I said almost always acoustic at the top of the review – the Danelectro 12 string that I have on semi-permanent loan from Mr Brutal himself. That Marshall crunch is there when you need it, but equally, its tone for the quieter acoustic stuff is there too. So what changed the other night? Bear in mind a lot depends on the acoustics of the venue, the mikes you’re using for the vocals, etcetera. But last night, for whatever reason, Kelly’s vocals were sounding a bit muffled on the Vox, so I switched them over to the Marshall. I’ve never heard her sound better. And, while the Vox did its usual good job with the Lag (and my occasional backing vocals) the Epiphone, out of the other Marshall input, was sounding fantastic. So there you are. It’s horses for courses, frankly. If you’re in a folk-rock band, or indeed country punk, the Marshall is a thoroughly good amp, with a sweet sound and plenty of oomph when you need it. I’m not going to be retiring my little Vox any time soon, neither. Tomorrow night’s a Brutal gig. The Vox is tucked up at home, safe and sound. The Marshall, though. The Marshall’s ready to get down and dirty in Henry’s Cellar Bar. And I know it’s got my back. WordPress may have put adverts below here. And they don’t need any amplification.